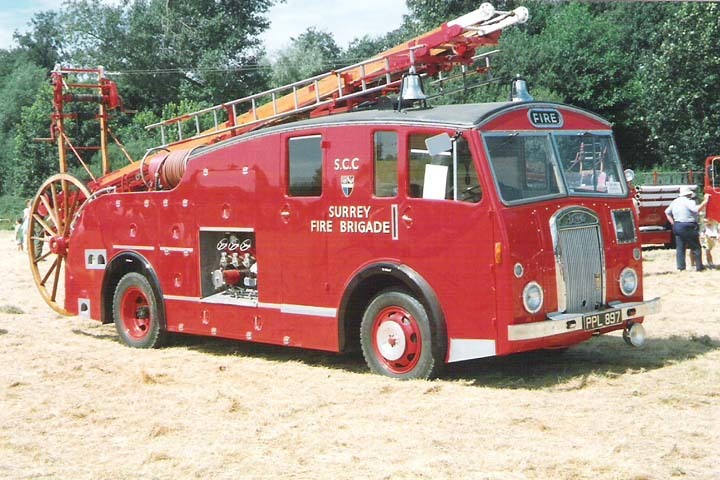 This lovely 1951 Dennis F12 Pump Escape with a 50ft ladder was issued to Godalming(retained)Fire Station.The Surrey Fire Brigade had around 25 of these famous Dennis F12 amidships pump/escapes,and this one remained at Godalming until 1973 when it was withdrawn from operational service and went to the brigades training school.On its retirement it was sold to an enthusiast and then onto a private company,it then ended up with a Sheffield fire presevation group.In1986,the appliance was again privately purchased(I think still by its present owner)and completely rebuilt and restored to its original condition. Pete: what a beautiful rig. Having both graceful lines and and simple functionality are a tribute to the coach-builders art. Balanced too - the twin bells: and I bet there is a matching hose-reel on the other side. And the mix of paint-work, natural metal (kudos to the lads that kept it polished!) and the varnished hardwood of the Wheeled Escape. What a great example of The Classic British Fire Engine. Added by Pat Rivers-Bowerman on 23 February 2009. Lovely picture Pete thanks, Pat says it all, I wonder how a modern crew would cope with an escape drill, probably wouldn't be allowed nowadays because of the dreaded safety elves! Added by John Stott on 23 February 2009. Added by Rick Loudon on 23 February 2009. Thanks Rick that made me laugh, reminds me of a "modern" crew looking at an escape at a rally I went to once. The subby ( sorry, crew manager!) was horrified that it was manual in operation! Added by John Stott on 24 February 2009.